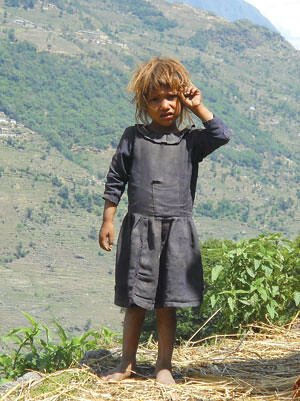 HUNGER TO LIVE: The hair of this young girl in Kalikot district has turned blonde due to under-nourishment. The mountain districts of mid-western Nepal have the highest rates of stunting among children because of the lack of enough food. The talk is all about elections under the CJ-led government in Kathmandu, but here in remote north-western Nepal people are too busy finding enough to eat to care. There are still two months to go for the monsoon, the fields are dry and dusty. Last year’s food ran out long ago. Farming in the rain-fed fields only provides food to last three months in a year, so the men have always migrated to India. Undernourished children fall prey to infections and the child and maternal mortality rates in Mugu and Bajura are more than twice the national average. These two districts are among 30 that are supposed to get food assistance from the state. 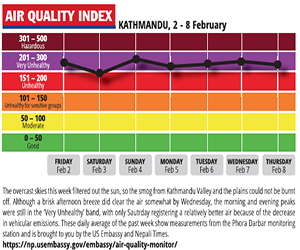 Although the quota of 1,000 tons of rice allocated for Bajura has been nearly met, officials are planning to fly in 600 tons more from Kathmandu to meet increased demand this year. Sixty-year-old Pune Sarki of Boldik village of Bajura and his family of 10 depend on subsided rice for nine months of the year. Since there is no fixed distribution schedule, sometimes Sarki makes the five hour journey back home empty handed because the rice runs out. At other times he doesn’t have enough money to pay Rs 40 for a kilo of rice. People from Humla walk for up to two weeks roundtrip to get rice from the depot at Kolti airport in Bajura. “I am taking rice on credit for now. My husband will pay back the loans when he returns from India in June,” says 30-year-old Dewu Tamata, one of many women here who have to buy food on credit. 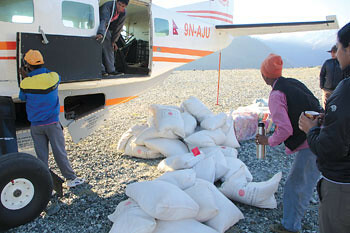 In Mugu’s Talcha airport, only 400 tons of the allotted 1,440 tons of rice for the district have been flown in this season. Nepal Food Corporation’s regional chief in Dhangadi, Surendra Raj Bista, says food is on its way. The government budgets Rs 370 million every year to subsidise and fly in food to these roadless districts, but it is always late and never enough. The UN’s World Food Programme (WFP) distributed 2,370 tons of rice in Bajura and 900 tons in Mugu as part of its ‘food for work’ initiative under which families can earn up to four months worth of food by working on roads. Even 17-year-old Hira BK from Mugu, who studies in ninth grade, helps in construction during holidays to earn food for his family. About 65 per cent of Mugu residents have calorie intakes of less than the minimum daily requirement of 2,709 kilocalories and the district has the highest rate of stunting among children. When children do fall sick, there is no treatment. The district hospitals in Bajura and Mugu never have doctors, nurses, x-ray machines, and labs. Space Times plans to go into orbit with Nepali first satellite programming has fallen victim to behind-the-scenes Indian pressure. Indians lose it over toothpaste and flashlights. The conditions that make educational institutions an easy target for Nepals revolutionaries are the very ones that would have failed us anyway, in ten, fifteen, twenty years.